What do you call your Garden? We purchased our home from Marjorie and Joe Cheshire in the winter of 1997 – 15 years ago. 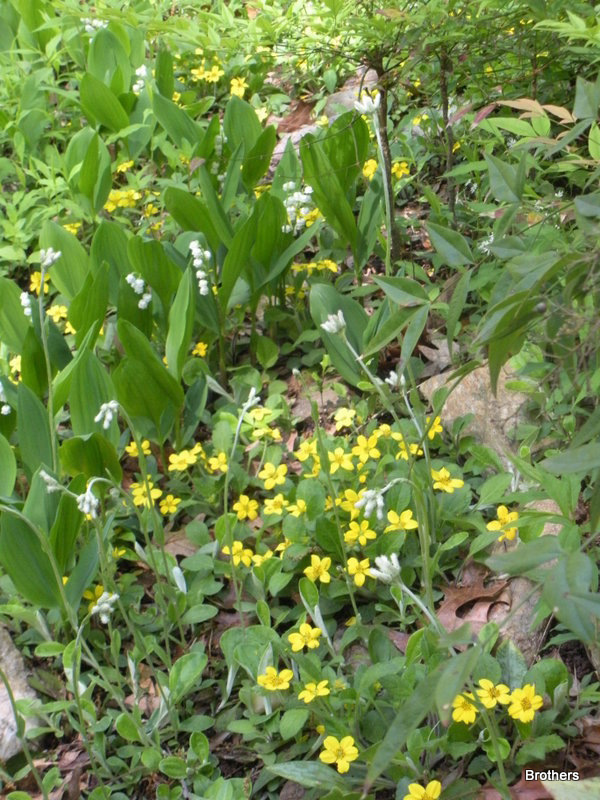 The garden of rescued wildflowers that Mrs. Cheshire collected, as Blenheim and Cary and other subdivisions around Raleigh were being developed, was a big influence. She loved gardening and wanted someone to purchase the house and love the garden as well. We have made some changes, but have tried to maintain the character of the garden with its amazing plethora of wildflowers that bloomed in “our garden” the first spring. 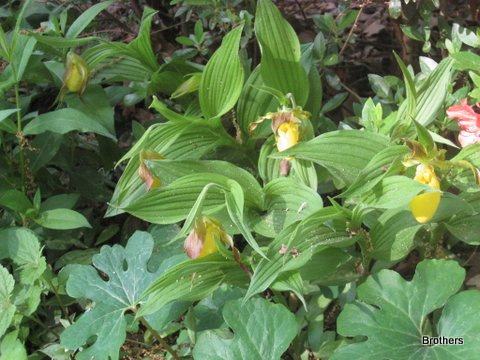 In talking with Mrs. Cheshire I got the feeling that as she rescued wildflowers in the area, she would plant the first treasures in her garden, then offer any duplicates to the Botanical Garden in Chapel Hill. Friends who accompanied Marjorie Cheshire on her rescue adventures tell colorful stories of the stamina of this little lady, who could dig up a group of gems, keeping plenty of surrounding soil so that the move did not shock the plants, and then carry them a long way over rough terrain and load them into her car. Her husband told us that she ruined 3 station wagons hauling wonderful rocks and boulders that line the paths, created terraced rock gardens, and stonewalls on the property. Our house is located on a deep keystone lot that slopes down a hill past fences and wooded terrain of neighbors’ back yards on two parallel streets. We feel like we are tucked in a woodland retreat – no grass to mow, and the sounds of birds chirping is very relaxing. John Abel Brothers, Jr. is from New Orleans, but has NC roots – his father grew up on a farm near Elizabeth City and his mother’s parents’ lived in Charlotte. Summer vacations were spent visiting family and attending conferences in Montreat, NC. Nancy: I grew up in Lynchburg, VA., in a family of active Garden Club of Virginia members, Enjoying flowers and beautiful gardens was a given. I loved living in an area with four seasons. The flowering apricot tree always bloomed for my birthday, all the children in my Sunday school class received pansies to plant in our gardens on Easter afternoon. One of my early memories was watching for the climbing rose-bush to show color so that we could cut red rosebuds to wear to church on Mother’s Day. Family outings were often Sunday afternoon rides thru the mountains to see the redbud and dogwood trees in bloom. Garden Week in Virginia was an anticipated annual event. My Aunt Bibber’s garden was open several years and I was able to skip school and serve lemonade at “Brookside.” When the mimosa trees bloomed we knew it was the beginning of summer vacation. Mother always planted window boxes with an assortment of coleus for summer color while the more formal garden in the back housed her daffodil collections as well as a central rose bed of wonderful hybrid teas. My aunt and uncle had a beautiful home and garden on the edge of the town – he was an architect by trade, and incorporated landscaping details in his drawings. His avocation was horticulture. My Uncle had a large vegetable garden and while my Aunt concentrated on flowers and shrubs. An avenue of English boxwood led up to their home. For me the musky smell of boxwood brings back wonderful memories of childhood. In Virginia it was the custom to move your boxwood with you when you moved to a different home – and my parents did. Fall brought a blaze of fall color and happy times raking leaves and planting bulbs. As Christmas approached we decorated with greenery from the yard, boxwood were trimmed for making wreaths and neighborhood teens would come to our door with mistletoe they had harvested from trees in the woods behind our house. Every season had its own benchmark activities out in nature. Gardens, flowers and learning about plants – was a continuous conversation in our home. John and I moved to New Orleans in 1972 and purchased our first home in a new subdivision. These were the oil boom days in the New Orleans suburbs. The builder completed six houses at a time along our street – so everyone around us was landscaping our “driveway to driveway” narrow lots at the same time. The semitropical vegetation was so different from what I had known growing up, it was fun to select trees, shrubs, perennials and annuals that were successful in that climate. That first house and garden became home to us for 25 years. Upon returning to the mid-Atlantic zone 7b wildflower garden after being in Louisiana for so long, I had a lot to learn. As a child I always thought that you would know all about gardening and how to arrange flowers when you grew up. Surprise – there is more to it than one gains thru osmosis. I purchased The American Horticultural Society A-Z Encyclopedia of Garden Plants and use it often. Gardening with Native Plants of the South by Sally Wasowski with Andy Wasowski – is a beautiful book. I enjoy visiting private and public gardens to glean ideas for combining plants in beds. 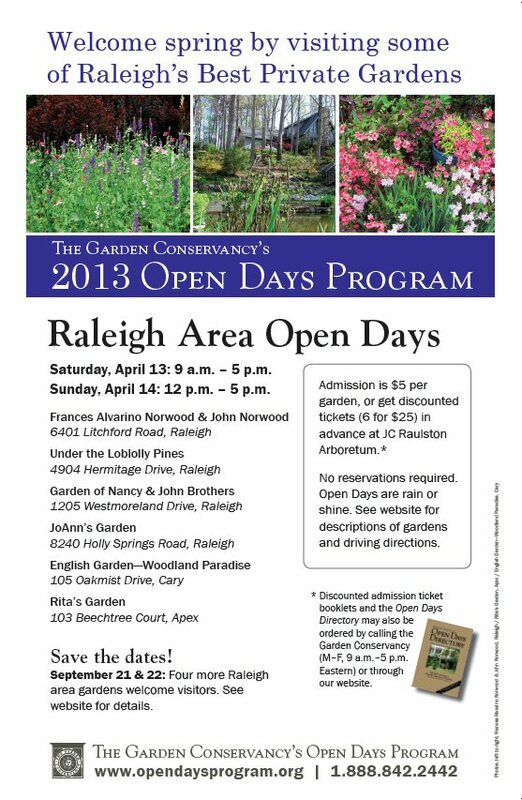 I am like a kid in a candy shop when I visit garden centers or read Horticulture magazine, Fine Gardening and Carolina Gardener -I hope to take advantage of Garden Conservancy Open Days in other cities and states across the United States. I enjoy traveling and seeing what is special in different parts of our country. John used to collect miniature roses, but is now enjoying bonsai gardening. .Anything new added to your garden? Last year we purchased a beehive and enjoyed watching the amazing community action of a bee colony. Unfortunately our hive collapsed in the late fall. We are awaiting a new shipment of nucs – bees and queens for two hives from Wake County Beekeepers Assoc. Because of the decline in the bee population for commercial as well as backyard beekeepers, it will not be until late April – May that ours arrive. It is a fun hobby with a huge learning curve for humans. We are still very much novices enjoying “our girls”. We built a wonderful covered porch, and open deck that overlooks our backyard. It gives a tree house perspective and overview of our garden. We enjoy watching the number of different birds that come to our feeders and birdbaths. and surprises found there– a patch of moss, ferns growing out of a rock crevice, tiny wildflowers that can be missed if not in en masse. 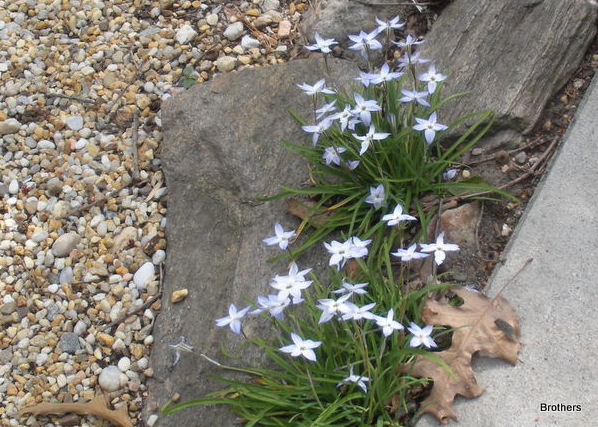 I love the winter/early spring garden as bulbs, and perennials begin to emerge. The angle of the sun at different times of day can reveal a small plant showing its head for the first time or buds swelling on tree branches. Even the chipmunks and squirrels add to the scene. (though squirrels can be very destructive and annoying). I have a favorite shovel that is fairly narrow, but has just the right weight and angle for almost any digging that I do. I also have a tool belt that holds clippers, gloves other tools and my Garden Knife and Sheath – which I use every time I am out in the garden. Mulch preference varies – I use pine straw in the front yard and around the house. In my back garden I really prefer leaf mulch. (Next fall I am ready – I found an electric Tri-vac blower/mulcher combo which does a good job of shredding leaves for mulch. With so many hardwood trees, I like using leaf mulch.) However, Pine mulch – triple shredded really looks nice and seems to cover well. I am out in the garden nearly every day – but when I go out to work in the garden, I cannot make myself come in. Since it is a native garden, with no grass, I do major work seasonally. Our covered porch is like an additional family room. We eat outside, enjoying the garden, daily during spring summer and fall. It is also a relaxing place to read or enjoy conversations with friends. Being down in the garden is where I enjoy meditating either sitting near the beehive, in the gravel path or on a garden bench. Working in the garden is good mental and physical therapy for me. And when the garden is in bloom and the heavy work is done – I get energy from just being outside and enjoying the beauty and peacefulness of my surroundings. John’s favorite place to relax and read is on our back porch with its overview of our magical garden. I would love to have someone come behind me as I work in the garden, picking up cuttings and cleaning up as I enjoy digging, planting, weeding, filling the bird feeders and birdbath – but dislike bagging and disposing of the mess. My garden seems to always be coming or going. Enjoy a garden, look for the little surprises there and give thanks for the beauty of nature all around us! Click Vanishing Bees for more information on this perplexing problem. This entry was posted in Garden Conservancy, native, Open Days and tagged Bees, birds, Botanical Garden, Garden, Garden Conservancy, Gardens, heritage, Kitchen garden, Native Refuge, nature, New Orleans, North Carolina, Photo, plants, Raleigh, sanctuary, Soul, Vanishing Bees, Virginia, Woodland. 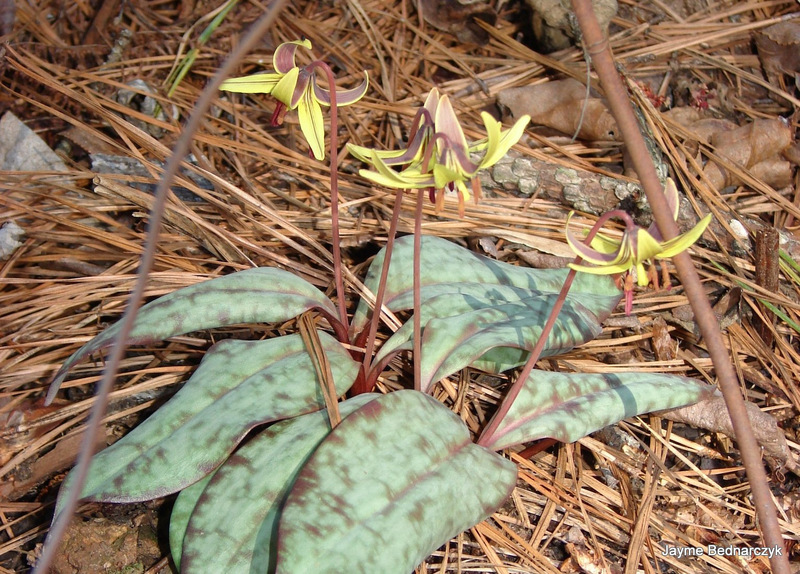 I love trout lilies and have tried several times to establish them in my woodland with no success. I think it must be too dry. I would love to get a start of them again. Gardeners are a persistent lot!